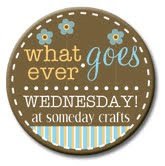 I get excited every Tuesday evening to see all the great projects for this party! This party is sponsored by My Creative Classroom. Go HERE to see what it is and to go HERE to enter the GIVEAWAY for TWO $25 scholarships. 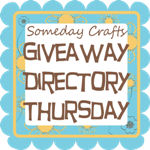 Also don't forget to come back tomorrow (Thursday) for the Giveaway Directory. I have a feeling there will be some amazing giveaways getting linked up!!! (Wink! Wink!) And Friday for the Candlestick Categorically Crafting Show. Even if you have linked a project with a candlestick to a WGW party before, come link it again. Thanks Michelle for hosting! I guess I am the only night owl that is up this time of night =) Hope you are having a great week!! Thanks! Sorry #9 has the wrong url. Can you delete it. Thanks for hosting again. I'll add the corrected link. Thanks for hosting! Those flowers look gorgeous, I'm on my way there now! Thanks for hosting!!! I love your site. How do I get your Wed. button? Hi Michelle, first thank you for hosting this fun party, and thank you for the feature on my ball finial! Thank you! Thanks so much for the party! :) I don't know if it's just me, but looks like because of the long word "Impatientlyprayingforpatience" in #44 has made that column extra wide, making the last column extra tiny, cutting off some of the words. Off to visit some links before work! Thanks for the fabulous feature! I am so glad you like my flowers! I am making a special request black one for a friend right now! Make sure to come back and try some of my recipes - I don't think you will be disapointed :)! Right now Crazy Daisy is hosting a Tuesday Tastes Party to show off other's kitchen inspirations - head on over to link up or to cast your vote for the People's Choice Award! Michelle, where do I begin. I can't believe that's me up there in your "blog to watch" spot! Thank you for your vote of confidence. I think you have higher expectations for my blog than I do. I'm excited and flattered. Secondly, and maybe I should be emailing this instead of commenting but, you'll send me the HTML for a button for my side bar? Or are you offering to create a "better more fancy header" for me? At any rate, I'll happily accept either one. Thanks so much for the offer (even though I'm a bit confused about what exactly you're offering.) Thanks for inviting me to join the party. I love these parties, meeting new talented people and getting inspired. Thanks for hosting, off to visit! Thank you sooo much for the wonderful party..I have been doing them for a few weeks now & just love them..Thank you also for letting us have up to 4 links & for giving us the space in which to type what it is..Some parties only give 25 spaces so you cannot even have full words..Your terrific..Have to go check everybodys stuff out..Have a great week!! P.S. I'm already a Follower..ope you can go to my blog & get inspired by something & be a Follower too. Thanks for hosting. I hope you are having a great week! 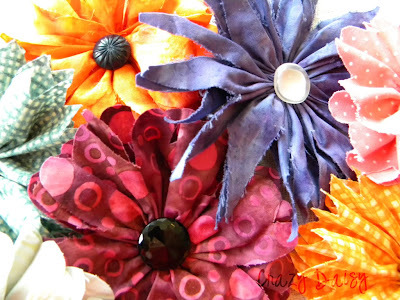 I'm off to look at those cool fabric flowers. What happened to the thumbnail pics with the links?